Journey from the intracoastal mansions of Fort Lauderdale, through the steamy decadence of Key West, and into the powerful underworld of organized crime in Miami where everything sparkles and shines (but only to hide a sinister darkness). Join Colin and Dolph, two wealthy college seniors, on a Florida Keys road trip that will call into question the very meaning of their collective existence. Their money is unlimited. What they value is the pursuit of escalating thrills that lie just beyond the edges of their fast-tracked, predetermined paths. In the end, it is the commerce of their lives that will ultimately become priceless. 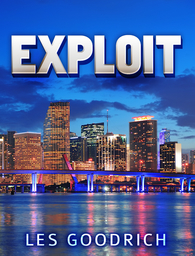 Exploit combines clear, fast-paced storytelling with eloquent, hypnotic prose. This is Florida Keys Fiction with the tropical flavor of a Caribbean Adventure. What begins in the tradition of the full-tilt Florida Keys Novels quickly captivates with irresistible language, an intricate tight-knit story, and an emotionally riveting twist. Exploit is the first book of The Abscond Series (Book 1 of 2), which has become a Caribbean Adventure Series to thrill readers who love exciting adventures, colorful characters, and well-crafted tales filled with such vivid and immersive descriptions that you will be startled when you look up to find yourself back in your favorite reading chair.